The story behind how two San Francisco entrepreneurs launch a new business serving professional, Olympic and "weekend" athletes through cutting-edge muscle activation techniques (MAT). 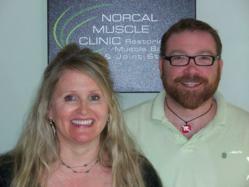 Co-owners of Norcal Muscle Clinic in San Franciso, Laura Miles and Derek Colderbank. We found we could have the future we wanted pretty easily. Globe University released today the details behind how two of its recent Master’s in Health Fitness Management graduates successfully launched a clinic in San Francisco. Read how entrepreneurs Laura Miles and Derek Colderbank turned their education into a booming business. With backgrounds in personal training, exercise science and post rehabilitation, Laura Miles and Derek Colderbank of San Francisco parlayed a pair of master’s degrees from Globe University online into a thriving Muscle Activation Techniques (MAT) clinic. The aptly named Norcal Muscle Clinic is unique in that it is one of only a handful of clinics nationwide offering this emerging technique. Greg Roskopf, the owner and founder of MAT, developed this technique over a period of 20-plus years. Roskopf is the bio-mechanic consultant to the Denver Broncos and has worked with professional teams such as the Denver Nuggets and Utah Jazz, and many individual elite athletes. MAT is the cornerstone of Globe’s master’s in Health Fitness Management degree. The MAT component is accomplished through three- to four-day weekend lectures and labs for 10 months. The remaining seven business courses can be accomplished online. MAT specialists have comprehensive knowledge of anatomy, human biomechanics and the four pillars of MAT: comparative assessment of mobility exams, positional iso-angular contractions, muscle testing, and digital force application to muscle attachment tissue. MAT is not a protocol-based system; therefore, students are given the tools to guide them through the MAT thought process, which focuses on muscular inhibition and weakness rather than symptoms of tightness and or pain. Roskopf’s vision for this degree is that all MAT specialists have the knowledge and skills to successfully open their own businesses that use MAT exclusively. Both Miles and Colderbank have developed a core following among professional athletes, including football and baseball players, triathletes, and Division I gymnasts. Their business has grown primarily via word-of-mouth as athletes share the successes they have had receiving MAT with their fellow teammates. Professional, Olympic and amateur athletes have found success at Norcal Muscle Clinic after more traditional treatments failed to provide relief or did not increase their overall athletic performance. MAT was especially pivotal for two of their starting football player clients before the 2012 NFC Championship game. Miles recalls both her and Colderbank spent many hours the week before the game giving the athletes MAT sessions so that the injuries from the previous NFC Divisional Championship game would not keep them out of this important event. Miles concurred: “It [the program] was a big awakening for us. We found we could have the future we wanted pretty easily,” referring to the doors the degree has helped open. With new degrees in their pockets and new clients calling every day for appointments, Miles and Colderbank are ebullient about the future. They cite aging baby-boomer statistics and thousands of other people seeking noninvasive procedures to manage pain as evidence that business will indeed be booming for years to come. Globe University is part of a family-managed collaborative body of career colleges, universities and training centers based in Woodbury, Minn. Through its mission, We Care, the organization integrates hands-on and career-focused education with service- and applied-learning experiences that expose students to their communities and real-world situations. Globe is accredited and offers master’s degrees—including the master’s in health fitness management—bachelor’s degrees, associate degrees, and diplomas in several career fields. More than 30 programs are available online.